Outlook.com accounts are the Office 365 servers and should be configured as an Exchange account in Outlook 2007 and newer. 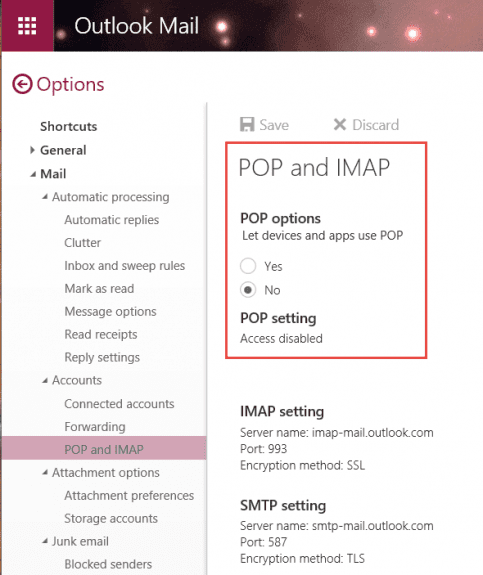 IMAP and POP3 are supported if you need email-only. Sync calendar and contacts using Outlook.com | Articles on the new Outlook.com. Note: Exchange ActiveSync was turned off in Feb. 2017 for Outlook desktop clients (phones and tablets can still use ActiveSync). Add the account as Microsoft Exchange or as POP or IMAP. Exchange services cannot be configured manually; use Auto Account Setup. If you enabled two-factor authentication on the Outlook.com account, you'll need to generate an app password to use with the account in Outlook. Multifactor support for Outlook.com accounts is expected in Outlook 2019, possibly also in mid-2018 builds of Outlook 2016. To set up an Outlook.com account using Exchange services, use Auto Account Setup. Enter your email address and password and Outlook will find the account information. Outlook 2003 users will need to use IMAP or POP3 to connect to the new Outlook.com server, and will lose Calendar and Contact sync. If you need calendar and contact sync, use the Windows 10 Mail client or take a look at eM client. The Outlook Connector is no longer supported. You'll need to add the Outlook.com account to your profile using Auto Account Setup so it is set up as a Microsoft Exchange account. Exchange ActiveSync is no longer supported for the desktop client. EAS is discontinued for Outlook desktop and all users will need to use Microsoft Exchange services. Exchange gives a much better experience (for example, multiple contact folders and contact groups, as well as Drafts folder syncs). EAS will continue to work on smartphones; however many smartphones now use EWS (Exchange web services) to access email. 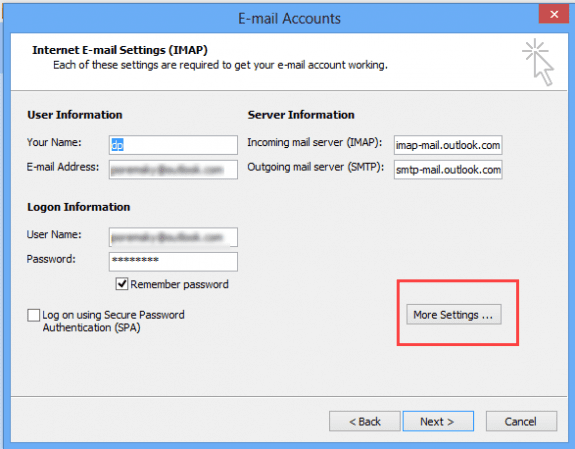 To set up an Outlook.com IMAP account in Outlook, you'll need to use the manual setup option. Server settings are below; don't forget to set the Outgoing Server tab (in More Settings) to authenticate with the mail server. Click More Settings button, then Advanced tab. 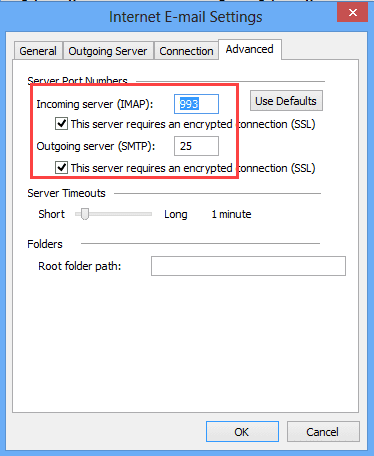 Select SSL as the encryption type for the incoming server. The port should change to 993 automatically. Change the SMTP encryption to SSL and the port number to 587. Outlook 2003 users will use Port 25 and SSL for Outgoing mail port. POP3 is disabled by default on Outlook.com accounts moved to the new server. You'll need to log into Outlook.com to enable POP3. Once enabled, you can choose whether to allow apps and devices delete mail from the server. While setting up the account, click on the More Settings button and on Outgoing Mail Servers tab, select the My server requires authentication box. Choose Use same settings as my incoming server. For Incoming mail (POP3), use Port 995. For Outgoing mail (SMTP), use Port 587 (port 25 if using Outlook 2003). Under both Outgoing mail (SMTP) and Incoming mail (POP3), select the ‘requires secure connection (SSL)’ check box. In Outlook 2007 and up, choose Auto; use SSL and port 25 for Outlook 2003. Under Delivery, select the Leave a copy of messages on server check box if you want to see your messages when you use Hotmail in a web browser, your mobile phone, or other e-mail programs. Adjust your settings in the account options online (under Accounts, POP and IMAP), and either let Outlook.com move the mail to special POP folder when Outlook tries to delete it from the server or let Outlook (and other clients) delete the messages. >> When trying the autodiscover process I was told to install the Outlook Connector (!). Since you had all updates installed, it was probably using the original autodiscover settings. Guys, you were the only ones with the right info to fix this! Much better than MS robots :) They key to connect Outlook 2003 to Outlook client is to authorize POP in Outlook live. That's all. Congrats. What if I set up my hotmail files in Outlook 2010 as IMAP in a .pst? What would be kept on the server? What would I see and what would I not see from the Outlook app on my phone/tablet? >> What if I set up my hotmail files in Outlook 2010 as IMAP in a .pst? This would only sync email, not calendar and contacts. It's certainly an option, if you only need mail. Autodiscover does not seem to work because when I try, I am told to download and install the Outlook Connector. (I have installed SP2 and see no other pending updates for Office 2010). IF I try to manually connect and then select Exchange Server, I am asked for the server name for the account. I have tried outlook.office65.com, but when I do the process 'hangs' for a what seems to be 3-4 minutes. I'm then told that the action cannot be completed. The connection to Microsoft Exchange is unavailable. Outlook must be online or connected to complete this action (I did this from the Mail(32) app in control panel. >> Autodiscover does not seem to work because when I try, I am told to download and install the Outlook Connector. Definitely don't install the connector. >> IF I try to manually connect and then select Exchange Server, I am asked for the server name for the account. I have tried outlook.office65.com, but when I do the process 'hangs' for a what seems to be 3-4 minutes. I'm then told that the action cannot be completed. This used to work... :( I discovered it no longer worked today. Autoaccount setup is the only way to set up the account now. I am sorry for asking, but perhaps you could be of assistance? I cannot get Outlook 2003 to connect to Outlook.com through IMAP. I have followed all of the instructions to no avail. Any assistance would be appreciated. I am thoroughly disappointed that my attempts to connect are not working. Use imap-mail.outlook.com as the incoming server name, use ssl (that will change the port #). for outgoing, use smtp-mail.outlook.com and ssl, but keep it on port 25. Outgoing server tab needs 'the same as incoming' setting checked. I am afraid that it still does not work for me. It yields an error message stating that the server does not support SSL, or Outlook 2003 itself crashes (as per information in the Event Log). Additionally, I apologize for asking the same question twice—I had just posted another question about this problem before reading that you had replied. I was not sure that the message I wrote yesterday had ever been submitted. If I may ask, does everything with Outlook 2003 work on your end? I hope that the issue is isolated to myself, as I would hate for the client not to work with Outlook.com. Yes, it does work here. Are you using imap-mail.outlook.com and smtp-mail.outlook.com as the server names? Yes, I am. The ports and encryption settings are set up as per your previous post. A cursory Internet search suggests that other users have had the same issue recently. I should note that the issue is not with my connection. I really do appreciate your help and I am open to any suggestions that you might have. Using Outlook 2003 with office 365 has been problematic, that's for sure. Office 365 (which includes Outlook.com) uses TLS or StartTLS for authentication of the outgoing server. Outlook 2003 only supports SSL so they enabled ssl - first using the 'normal' secure ports of 465 and 587, then switching to 25 to make it easier for users. It does work here, using the server names i posted (and have in the screenshot) - i removed the account and added it back, just to verify it could be added. The only other option, besides upgrading to a supported version, is to use a different client. I recommend eM Client as a good replacement for Outlook for mail, calendar, and contacts from outlook.com. I have a somewhat related question. I have Outlook 2016 (PC) set up with an Office 365 for Business Exchange file (.ost file) and have two Gmail accounts linked to the same .ost file. This works fine. But can I set up an Outlook.com email account in the same way (i.e., link it to the existing .ost file and have all my contacts, calendar items, etc. in the one .ost file). Because Outlook.com is now also an Exchange service that uses .ost files, I am concerned that this may create a conflict. how is the outlook.com account set up? If it is it set up as pop3, it won't be a problem - that is download only. if you need outlook.com's calendar and contacts, you need to set it up as exchange and it will have its own data file. Thanks for the clarity. However can you please help me. Last week I bought office 365 personal subscription for 1 year. I have Outlook.com address when I am going to create a new outlook.com account it automatically creates exchange auto sync server (eas.outlook.com) and I got an email for reconnecting my account. there is no error mesage.though. Is there any way to igonore eas.outlook.com address and replace it with actual server address. EAS is not longer supported in Outlook desktop. Autodiscover should use the correct server (Microsoft Exchange) - you might have to delete autodiscover files from your computer but first try choosing manual set up then enter the outlook.com address in the Office 365 email account field. Autodiscover files are at %localappdata%\microsoft\outlook - delete all and try again.